Bodies are developing quickly. School work is escalating. Life is busy. The teenage years ask a lot of young bodies and minds. It’s not surprising that many parents worry when their teenager announces they are becoming a vegan. In this post I hope to allay some of your concerns. I’ll give you some practical advice on how to deal with the situation, where to look for help and some basic food ideas to get you started. If your child has decided to adopt a vegan lifestyle you could be feeling a little bewildered. What does this mean for their health? How can the whole family adapt to these changes? Food can be a really emotive subject. When one family member is suddenly expressing what might seem like extreme views about what they are eating- tension can rise at home. Veganism is becoming increasingly popular. Research carried out in 2016 by Vegan Life magazine and the Vegan Society showed there are there are over half a million vegans in Great Britain. That’s an astonishing 350% increase over the past 10 years. Almost half of those who consume a plant-based diet are aged between 15-34. Deciding to become a vegan will probably not have been an easy or quick decision for your child. Listen to your teenager and their reasons for this change of lifestyle. Chances are they will have done a lot of research. Let them show you what they’ve been reading. Treat them like a young adult rather than a child and there’s more chance you’ll develop a healthy dialogue about the issue. Animal welfare, sustainability, weight loss and improved health are some of the triggers that motivate young people to become vegan. They may feel quite passionate about these issues so try to understand their feelings. I recommend taking your child to see a BANT (British Association for Applied Nutrition and Nutritional Therapy) registered nutritional therapist. Nutritional therapists are fully qualified to explain which foods are important for your child to ensure they are getting the right nutrients for good health. They’ll provide plenty of practical meal ideas and perhaps introduce you to some unfamiliar foods. Nutritional therapists are trained to understand each individual’s health concerns so they can identify if your teenager needs to pay attention to any particular nutrients and may recommend testing if necessary. “When Izzy first told me that she was a vegan, she called me up to her bedroom and said “Mum I have something to tell you!” All sorts of thoughts went whizzing through my mind! When Izzy said “I’m a vegan” I wasn’t sure what to say except “Oh okay!” Izzy produced a little booklet that she had made containing key information and recipes. Izzy had given this decision much thought. At first I was really worried as Izzy was only 14 and she was still growing. It was vitally important for me to understand that she was getting all the correct nutrients. I booked to see a nutritionist and this was very helpful as I didn’t have a clue about the vegan diet. Izzy is passionate about her diet and loves to cook and experiment with food. My kitchen is now full of foods I had never heard of a year ago – tahini, chia and flax seeds, baobab powder, cacoa butter, spirulina and maca. You name it, we’ve got it! Life is busy. The last thing you need is to be cooking separate meals for one member of the family. Let your teen take some responsibility for planning and preparing their meals. School may not cater well for vegans so a packed lunch might be needed. Encourage them to make this themselves. Get them to give you a list of ingredients to include in the weekly shop. Vegan food is often delicious with plenty of herbs and spices so share some meals. Try recipes yourself and get your teenager to cook for the family. You might surprise yourself how much you enjoy the food. Bursting with vegetables, beans, pulses, nuts, seeds and fruit, a well-planned vegan diet provides nearly all the vital vitamins, minerals, antioxidants, phytonutrients and fibre that a young body needs to grow and develop. The optimal vegan diet is rich in fresh ingredients and a lot healthier than a typical teenager’s diet. In fact, a vegan diet has been shown to be protective against many chronic illnesses. “I watched a very interesting documentary last year about where food came from and in particular meat and dairy and I started to make a connection with the food on my plate. I vowed then that I would never touch animal products again. Also, I remember seeing the words “Vegan-friendly” and I searched for recipes for hours online and read lots of blogs. 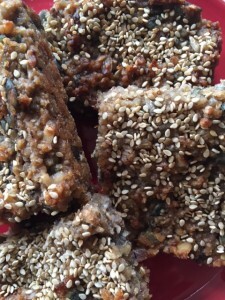 It’s sensible to make sure your teenager always has a good supply of protein rich snacks such as these Zesty Seedy Flapjacks. It can be difficult to find healthy vegan options when they are out with friends and they may end up eating nothing at all unless they have their own food with them. These days, many nutritional therapists use nutrigenomic testing. This can identify whether variants in particular genes might lead to an increased need for certain nutrients. Your nutritional therapist will explain possible health consequences and can recommend suitable nutritional supplements. A vegan diet may not be best for everyone. Many people thrive as vegans but there are others who suffer with low energy and poor health. We are beginning to understand that this could be down to genetic differences. Which nutrients might be low in a vegan diet? To support developing bones and muscle and hormone production, protein should form part of every meal. Most plant sources of protein such as beans, lentils, nuts and seeds are incomplete meaning they lack one or more of the essential amino acids. Eat a variety of these foods each day. Soy (tofu, soya milk, tempeh, miso), quinoa and spirulina are complete proteins so should be eaten regularly. Omega 3 fatty acids are particularly important for teenagers because of their role in brain health. They have been shown to aid concentration and improve mood. The best source is oily fish where the omega 3 fats are in their most useable form as EPA and DHA. Plant sources are flaxseed, chia seed, hemp seed and walnuts where they are found as alpha-linolenic acid (ALA). The body must convert ALA to EPA and DHA to get the health benefits. This conversion is often quite poor and vegans are often low in both DHA and EPA despite eating plenty of ALA rich foods. A nutritional therapist may recommend a test to measure essential fatty acid levels particularly if your teenager suffers from depression or low mood. Young people need adequate amounts of calcium in their diet to build healthy strong bones for the future, particularly girls who can be at a higher risk of osteoporosis in later life. Fortunately, a dairy-free diet can provide optimal amounts of calcium. Good sources are tofu, sesame seeds, tahini, almonds and green leafy vegetables. Soy and almond milks are often fortified with calcium. Iron helps to transport oxygen around the body within our red blood cells. Low levels are associated with fatigue, pale skin and poor memory. Girls who are menstruating and teenagers who do a lot of endurance sport have increased needs for iron. Iron from animal products tends to be better absorbed than plant sources. Improve absorption by including vitamin C rich foods at every meal, soaking nuts and seeds and avoiding tea or coffee at meal times. Iron rich plant foods include spinach, edamame beans, lentils, chickpeas and dark chocolate. Your G.P. can measure iron levels if you are concerned. Vitamin B12 is crucial for a healthy nervous system and the production of healthy red blood cells. As it is only found in animal foods, vegans either need to take a vitamin B12 supplement or eat B12 fortified products such as milk alternatives or nutritional yeast flakes. If your teenager is exhausted all the time low vitamin B12 could be a factor. Ask your G.P. to check this out. Not only do young people need adequate vitamin D to keep their bones healthy, but low levels are also linked to poor immunity and depression. The best source of vitamin D is sunlight- ideally daily full skin exposure for 20 minutes. In the U.K. that isn’t possible for most of the year. Food sources of vitamin D are limited. Vegans will find some in fortified foods and mushrooms. A vitamin D supplement could be beneficial although not all are vegan. A nutritional therapist will recommend a suitable product. Becoming a vegan can be a positive choice, allowing your child to grow in independence, gain control in their life and improve their health. However, occasionally it may be an excuse to start overly restricting their diet and avoiding eating altogether. In this case you may already have noticed signs of an eating disorder such as missing meals, anxiety over eating in public places or being secretive about food. If you are concerned seek professional help as soon as you can. Eating disorders are much easier to treat the sooner they are identified. For more information you can visit the B-EAT website (The UK’s eating disorder charity) or call their helpline 0345 634 1414. If you would like some support for your vegan teen please feel free to contact Michelle to arrange a free confidential chat.